Once you've got the hang of keeping your fish healthy, it's time to think about making them happy. Many fish are more intelligent than is popularly realised, and providing them with adequate mental stimulation will help to keep their stress levels low, resulting in better health. Having fun activities available also helps to keep fish fit and reduce their aggression, and it can make it easier for them to bond with their keepers. Toys for your fish can be purchased from pet shops or made at home, but there are important safety considerations that should always be your first priority. Most obviously, nothing that goes in your fish tank should have sharp edges. Some plastic moulded toys have sharp spurs of plastic where they have been poorly put together. Look out for these. You can make them safe using scissors and a file (even a metal nail file will do). Because most metals are gradually broken down in water and can produce compounds harmful to your fish, it's best never to use metal toys. Sometimes toys have internal metal parts. These can still be problematic, so check carefully. Remember that what matters is not just the state of the toy when new, but the state it may end up in after being played with for some time. Be careful to avoid toys with bits fish could pull off and swallow. Similarly, you should avoid toys with holes fish could get stuck in. If your fish are growing, beware of old toys becoming dangerous over time. Often toys that look exciting to you will be ignored by your fish. In order to avoid disappointment, try to think about how your fish relate to the world and what's likely to be important to them. Shiny toys may be boring, for instance, because they live in a world with glass walls so they're used to reflections. Not all fish have good colour vision (predators tend to sense movement better than colour), so colourful toys may not be appropriate, depending on species. Some fish become aggressive when they see the colour red and this can lead to them fighting each other. Others, however, love very simple colourful toys that they can move around and arrange. 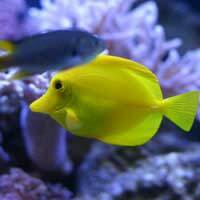 Like other animals (including humans) fish tend to find toys more interesting if they are easy to interact with. As they are generally limited to biting or pushing, toys that are highly flexible or lightweight enough to push a long way are the best option. With some species, such as loaches, you may be lucky enough to see individuals working together to manipulate a toy more effectively. Although individual fish vary a lot in their interests, there are some simple types of toy that they frequently enjoy. You may need to play with them at first to show them how it's done, or you may find that they incorporate the toys into games of their own devising. Football - a simple ping pong ball can be pushed across the water into a goal at either end. Once fish have got the idea they will often play this on their own initiative. You can make it more of a challenge by adding floating plants that they need to weave the ball around. Heavier balls can be used for fish who prefer to play on the bottom of the tank. Bridges and tubes - fish generally love having toys like this to dart through, especially if they are shoaling fish and enjoy chasing each other. You can even buy floating tubes to make playing near the surface of the water more fun. Water wheels - plastic wheels of an appropriate size are available from many pet shops. Fish often enjoy turning them round and sometimes learn to do so by placing stones on them. Some wheels are designed to turn round by themselves, which can increase their appeal to hesitant fish. Ladders and stakes - simple items like these can provide fish with lots of amusement as they weave in between them and in and out of spaces. If your fish are unsure how to engage at first, try rewarding them with small amounts of food for playing games successfully. They'll soon learn to enjoy the activities for their own sake. I have flowerhorn fish. I want to buy toy for him. I want to know what kind toy should I buy ?